Bush Christmas / [words] David Martin ; [music] Wendy Hiscocks. Includes text to poem by David Martin. 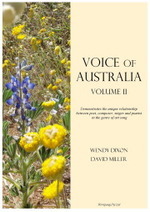 Score: Voice of Australia : Volume II / compiled by Wendy Dixon and David Miller.